William Harrex-Perks, Henry Harrex-Perks, Ollie Baker, Dave Statham (in the hi vis), Isobel Harrex-Perks, George Harrex-Perks, Jack Statham and Katy Statham against the fence. A community bicycle and scooter rack has been built at a Findon school, with the work completed by parents and volunteers. Based at St John the Baptist CE Primary School, the aim of building the racks was to help reduce traffic congestion and pollution while promoting a healthy lifestyle. 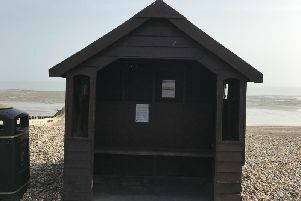 The project was funded by West Sussex County Council and the St John the Baptist CofE Primary School parent-teacher association, supported by Active Communities and the West Sussex Community Volunteer Scheme. Volunteers say that the new bike racks have already helped to ease traffic in the area while also helping adults and children to get their recommended daily exercise. Sadie Collis, parent-teacher association chairman, said: “We would like to give a huge thank you to the West Sussex Community Volunteer team and those parents that helped build this great community resource.